The value exchange of data can be expressed during sign-up in terms that are informative, transparent and in an enjoyable format. 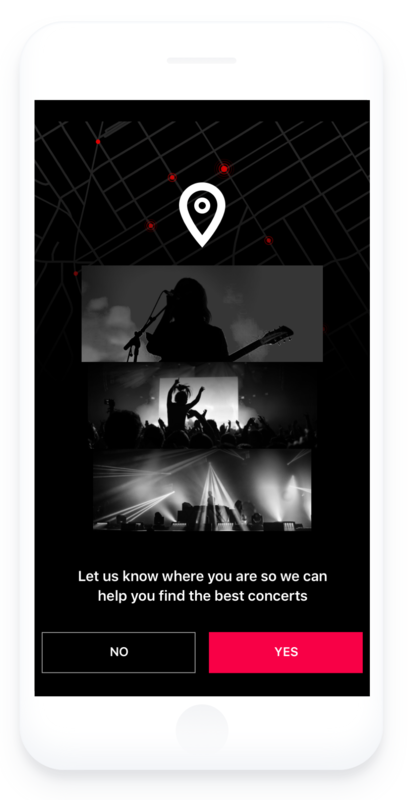 Fanfare is a fictional music app that connects people to the best live concerts and music based on their location and taste. Location data is used to initially find concerts nearby and then make on-going suggestions. Third party data is used to tailor suggestions to people's tastes. Ultimately, data helps Fanfare improve the usefulness of recommendations it provides. People can be asked to provide a significant amount of data during sign up before they have an overall sense of the trustworthiness and usefulness of the service. This is especially challenging when services ask for multiple data sources, including third party data, at the outset. The cross-functional Design Jam team challenged themselves to consider how Fanfare could ask for data sources during sign-up, in a way that fostered trust. The contextual nature of this consent flow makes sharing data natural as people can see how sharing can help them get what they like. It's a powerful way to foster trust. Finding ways to provide context for upfront consent requests, will enable people to become more involved in their data and privacy management. Explore how settings can become as transparent up-front as they are on-demand.